The bank is the principal subsidiary of Lloyds Banking Group, which was formed in January 2009 by the acquisition of HBOS by the then-Lloyds TSB Group. That year, following the UK bank rescue package, the British Government took a 43.4% stake in Lloyds Banking Group. As a condition imposed by the European Commission regarding state aid, the group later announced that it would create a new standalone retail banking business, made up of a number of Lloyds TSB branches and those of Cheltenham & Gloucester. The new business began operations on 9 September 2013 under the TSB brand. Lloyds TSB was subsequently renamed Lloyds Bank on 23 September 2013. On 17 March 2017, the British Government confirmed its remaining shares in Lloyds Banking Group had been sold. Lloyds Bank is the largest retail bank in Britain, and has an extensive network of branches and ATM in England and Wales (as well as an arrangement for its customers to be serviced by Bank of Scotland branches in Scotland, Halifax branches in Northern Ireland and vice versa) and offers 24-hour telephone and online banking services. As of 2012[update] it has 16 million personal customers and small business accounts. The origins of Lloyds Bank date from 1765, when button maker John Taylor and Quaker iron producer and dealer Sampson Lloyd set up a private banking business in Dale End, Birmingham. The first branch office opened in Oldbury, some six miles (10 km) west of Birmingham, in 1864. The symbol adopted by Taylors and Lloyds was the beehive, representing industry and hard work. The black horse regardant device dates from 1677, when Humphrey Stokes adopted it as sign for his shop. Stokes was a goldsmith and "keeper of the running cashes" (an early term for banker) and the business became part of Barnett, Hoares & Co. When Lloyds took over that bank in 1884, it continued to trade "at the sign of the black horse". In January 2017, the bank suffered interruptions to its online services originally blamed on "unspecified technical glitches". A hacker reportedly claimed responsibility for the attack, demanding around £75,000 from the bank in a "consultation fee". The Teddington branch of Lloyds Bank in the west of Greater London, designed by Randall Wells in 1929. The London Bridge branch of Lloyds Bank in London, designed by Philip Hepworth in 1928. In December 2013, Lloyds Banking Group had been fined £28m for "serious failings" in relation to bonus schemes for sales staff. The Financial Conduct Authority said it was the largest fine that it or the former Financial Services Authority had imposed for retail conduct failings. The bonus scheme pressured staff to hit sales targets or risk being demoted and have their pay cut, the FCA said. Lloyds Bank has accepted the regulator's findings and apologised to its customers. Based on figures from the National Audit Office, George Osborne's sale of a 6% tranche of Lloyds shares in autumn 2013—despite his claims that the sale had netted a profit—worked out at a loss of at least £230m for UK taxpayers. However, after the British Government confirmed all its remaining shares had been sold on 17 May 2017, Lloyds Bank said the government had seen a return of £21.2bil on its investment, an approximately £900m profit. 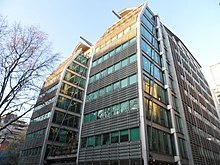 In July 2014, US and UK regulators imposed a combined £218 million ($370 million) in fines on Lloyds and a number of subsidiaries over the bank's part in the global Libor rate fixing scandal, and other rate manipulations and false reporting. A number of phishing email scams have been engineered in 2015, 2016, 2017 and 2018 into making the recipient believe that they are receiving an email from Lloyds Bank or Lloyds TSB. Though these emails have had nothing to do with the bank per se, they often are sent by official looking email ids with the bank's domain name. Typically, they contain an authentication code which is sent as a distractor. The linked pages usually allow the recipient to enter their personal information related to the bank, leading to their bank accounts being hacked. ^ Change of Company Name press release by Lloyds TSB Group plc, 16 January 2009. ^ a b Parsons, Russell (4 September 2013). "Lloyds Bank to return to high street on 23 September". Marketing Week. Retrieved 10 September 2013. ^ a b "Share sale returns Lloyds to private sector". BBC News. 17 May 2017. Retrieved 17 May 2017. ^ "Lloyds Bank profits hit by bond buyback". BBC News. 28 April 2016. Retrieved 2 May 2016. ^ Lloyds TSB: Case Study Archived 17 July 2011 at the Wayback Machine. The Work Foundation. January 2005. ^ In 2016 the Oldbury building, no longer occupied by Lloyds, was described as "at risk" by Save Britain's Heritage. Jones, Tamlyn (29 June 2016). "Nine treasured West Midlands buildings at risk of being lost forever". Birmingham Post. Retrieved 10 July 2016. ^ "Timeline 1851 - 1900". Lloyds Banking Group. 2013. Retrieved 22 September 2013. ^ "Bosanquet, Salt & Company Records". archiveshub.ac.uk. Retrieved 3 February 2016. ^ "History of Plastic Cards" (PDF). The Association for Payment Clearing Services. Archived from the original (PDF) on 28 January 2006. Retrieved 26 April 2014. ^ "Obituary: Sir Brian Pitman". The Telegraph. 12 March 2010. Retrieved 29 March 2012. ^ Roger Cowe (11 March 2010). "Obituary: Sir Brian Pitman". The Guardian. Retrieved 29 March 2012. ^ Blackden, Richard (31 July 2007). "Lloyds sells Abbey Life for £977m". The Telegraph. Retrieved 22 September 2013. ^ "Lloyds TSB buys Scottish Widows". BBC News. 23 June 1999. Retrieved 22 September 2013. ^ "Q&A: Standard Life demutualisation". BBC News. 31 March 2004. Retrieved 22 September 2013. ^ "Lloyds TSB/Abbey tie-up blocked". BBC News. 10 July 2001. Retrieved 22 September 2013. ^ "Moody's downgrades 12 UK financial institutions". Moodys.com. 7 October 2011. Retrieved 29 March 2012. ^ Seawright, Stephen; Muspratt, Caroline (14 March 2007). "Lloyds TSB becomes Olympic sponsor". The Telegraph. Retrieved 22 September 2013. ^ Sharp, Tim (25 April 2013). "Co-op Bank pulls out of Lloyds Verde deal". The Herald. Glasgow. Retrieved 22 September 2013. ^ Simon, Emma (26 November 2012). "Millions of Lloyds customers told banking details to change". The Telegraph. Retrieved 22 September 2013. ^ "Lloyds faces internet issues on TSB launch day". BBC News. 9 September 2013. Retrieved 14 September 2013. ^ Spence, Peter (20 June 2014). "Why TSB's share price has jumped by 13pc on its first day". City A.M. Retrieved 9 October 2015. ^ Williams-Grut, Oscar (30 June 2015). "TSB is now officially Spanish". Business Insider UK. Retrieved 9 October 2015. ^ Stephen Morris (23 October 2014). "Lloyds Said to Cut 9,000 Jobs Amid Online Banking Shift". ^ Goodway, Nick; Prynn, Jonathan (28 July 2016). "Lloyds Bank slashes 3,000 jobs as boss issues Brexit impact warning". London Evening Standard. Retrieved 28 July 2016. ^ Leyden, John. "Lloyds Bank outage: DDoS is prime suspect". The Register. Retrieved 24 January 2017. ^ Ashok, India (23 January 2017). "Lloyds hit with massive DDoS attack by suspected hackers". International Business Times UK. Retrieved 24 January 2017. ^ Ashok, India (24 January 2017). "Lloyds DDoS attack was launched by a hacker attempting to extort £75,000 from the bank – report". International Business Times UK. Retrieved 24 January 2017. ^ "Lloyds Bank in high street relaunch". The Belfast Telegraph. 23 September 2013. Retrieved 23 September 2013. ^ "Changes to Lloyds TSB International". Lloyds Bank. September 2013. Archived from the original on 26 September 2013. Retrieved 22 September 2013. ^ "Information about us". Lloyds Bank. September 2013. Retrieved 22 September 2013. ^ "Subscribers". Lending Standards Board. Retrieved 5 November 2015. ^ "Lloyds TSB counting the cost of the PPI scandal". DPA Claims. 16 May 2012. Archived from the original on 30 July 2012. Retrieved 16 September 2013. ^ Robinson, Michael (25 March 2014). "Lloyds accused of short-changing PPI claimants". BBC News. Retrieved 29 March 2014. ^ "Lloyds hit by record £117m fine over PPI handling". BBC News. 5 June 2015. Retrieved 3 February 2016. ^ Anna Morser (October 2008). "Banking on Bloodshed: UK high street banks' complicity in the arms trade" (PDF). War on Want. Retrieved 2 November 2012. ^ Sweeney, John (21 September 2009). "Tax inquiry into Lloyds off-shore". BBC. Retrieved 23 September 2009. ^ "Q&A: Panorama on Lloyds offshore". BBC News. 21 September 2009. Retrieved 23 September 2009. ^ Farndon, Lucy (22 September 2009). "Lloyds under fire after BBC tax revelation". Daily Mail. Retrieved 22 September 2013. ^ "Lloyds bank fined record £28m for 'serious failings'". BBC News. 11 December 2013. Retrieved 11 December 2013. ^ "'£230m taxpayer blow over Lloyds'". Press Association. 19 December 2013. Retrieved 23 December 2013. ^ "Britain's Lloyds Bank fined $370 mn over Libor rigging". Daily Mail. Retrieved 28 July 2014. ^ "Lloyds TSB 'Internet Banking Account Status' Phishing Scam". www.hoax-slayer.com. Hoax slayer. Retrieved 15 November 2018. ^ "New Lloyds Bank Phishing Scam Detected". Spam Titan. 22 December 2015. Retrieved 15 November 2018.